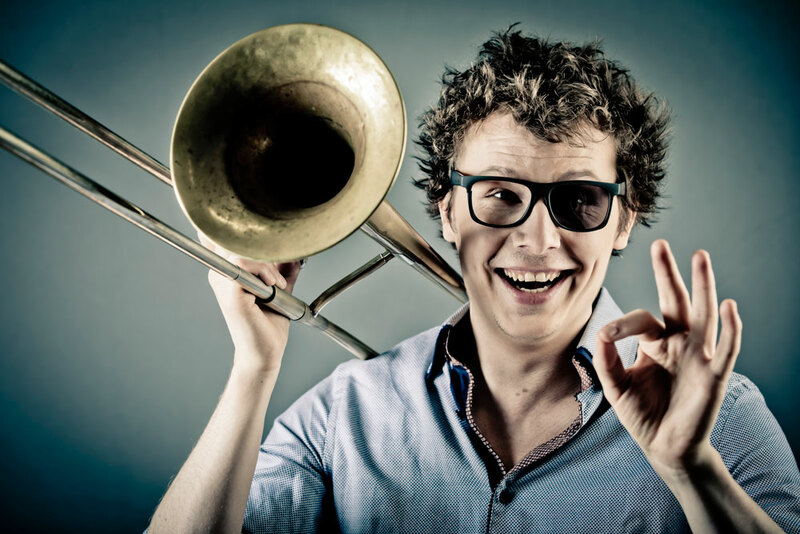 Simon Kintopp, born 1986 in Erlangen / Germany, studied Jazz Trombone in Nuremberg with Silvan Koopmann and at the Kunstuniversität Graz with Ed Neumeister. He finished the bachelor studies both in performing as well as in education. At the moment he is doing his Master studies in Jazz Composition and Arrangement at the Kunstuniversität Graz with Ed Partyka and Michael Abene. Since October 2018 he is chairman of the austrian students union at the Kunstuniversität Graz (ÖH-KUG) where amongst other things he is organizing a monthly concert series, featuring the university´s students. Since 2015 he is also part of the organization team of the Jazzwerkstatt Graz and their annual 6-days long festival. Simon Kintopp is also an active music educator since eight years, teaching students with various ages from 6 till 60 years. Simon Kintopp was working with Bands like: Jazz Bigband Graz, Graz Composers Orchestra, Concept Bigband, Jazz Orkestar Zagreb, Landesjugendjazzorchester Bayern, On Cue Bigband Nuremberg, Saint Chameleon, Yambalaya, Carlos Reisch, Eddie Luis & Gnadenlosen XL, a.o. He played with Arists like: John Hollenbeck, Dave Liebman, Joe Lovano, Randy Brecker, Ray Anderson, Bobby Shew Morten Ramsbol, Stafford James, Don Menza, Mike Holober, Jiggs Whigham, Hayden Chisholm, a.o.